That's what will dominate our food choices. But will we choose wisely? What will we be eating 25 years hence? Asking this is not merely self-indulgent crystal ball-gazing but a matter of serious concern. We are what we eat; our survival and good health depends on food. Besides, processed and packaged foods are “big business” globally, inextricably entwined with non-traditional security and cultural imperialism. Technological advances of varying magnitudes are dramatically transfor ming what we eat and the way we eat, live and die. With bleeding edge technologies fast becoming part of the production and processing of food, terms like “terminator seeds” and “molecular cuisine” have entered common parlance. And today, none of us in the realm of food can afford to hum Que Sera, Sera (Whatever will be, will be)! Lifestyle diseases like diabetes, blood pressure, coronary disorders and certain cancers are all closely related to the type of food consumed. In fact, lack of nutritious food results in impaired immunity, which makes one vulnerable to communicable diseases, both fatal and debilitating. But today’s youth faces the complex challenge of choosing the right food or food product. A walk through malls and department stores in metros and mini-metros gives one the impression that the “age of plenty” has arrived. Shelves spilling over with imported fruits, exotic vegetables, fish from distant seas and dairy products, each with a special taste, are a feast for the eyes. Then there is a mind-boggling array of convenience products—“heat and eat” curries, “one dish meals”, “pickles and preserves”, cakes and bakes, frozen desserts, chocolates and cheeses, and, not to forget, the healthy organic produce. It’s not that these phenomena are confined to big cities or affluent sections of society. They have a steady trickle-down effect. Clever advertisements have over the years succeeded in positioning many food items as “aspirational” with “trendy taste for the generation-next”. Burgers and Pizzas donning a desi garb can be encountered at ubiquitous roadside kiosks, pushcarts and hole-in-the-wall eateries, even in small towns. Homemade snacks, sweets, sherbats, pickles and preserves are all but vanquished by the mass-produced bottled or Tetra-packed stuff. But this does not mean that people are blindly embracing packaged and convenience foods. There are many, particularly the young, who are becoming increasingly health-conscious. They wish to eat sensibly, seasonably and enjoy slow cooking at home, preparing everyday food with fresh ingredients uncontaminated with toxic additives—flavours, colours and synthetic preservatives. Parents are also increasingly becoming concerned about nutritional requirements of growing children. Schools and work places are under pressure to junk the junk food. If this consciousness spreads across the country then there is not much to worry about. The country’s youth that comprises more than half the 1.25 billion population, will enter their middle age in the pink of health and their parents will grow into being senior citizens who are able to look after themselves and smile serenely at the sunset. The great variety of regional and ethnic cuisines in the subcontinent will continue to tickle the palate and proliferate across the length and breadth of India. Improvements in infrastructure will, in all likelihood, encourage economies of scale and make the healthy organic produce affordable. The fascination with exotic food—Norwegian Salmon, Australian Lamb, Californian Prunes, Belgian Choco lates, and many more—will most probably fade, and finally, efforts at promoting “fusion” will be given up. This writer believes that ultimately the taste in our DNA will dominate our choices in matters of food. After all, the biggest names in the international food industry have made compromises to gain a foothold in the Indian market. 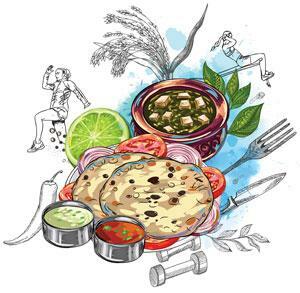 This is illustrated by the evolution of alu tikki burgers, paneer wraps and navaratri pizzas with kuttu atta (buckwheat flour). Confluence of tastes and adoption of ingredients and cooking techniques have shaped our cuisines. This process, if not deliberately interrupted, will continue in the coming decades and, after a quarter- century, we may be regaled by the offsprings of culinary love marriages like paneer dosa, kurkuri idli chaat or tandoori phool. What is heartening is the revival of millets, commitment to cutting down fats, resistance to refined sugar, aversion to salt and increasing awareness of dangers lurking in transfats. Those who can afford to spend the extra rupee are happy to flaunt their addiction to artisanal food products. However, there are hazards that can derail us. Few today bother to read the labels, especially the fine print. The mark of the Food Safety and Standards Authority of India should not be treated as a seal of unconditional approval. While it may provide reassurance about food hygiene, it does not say much about the colours, flavours, deoxidants and stabilisers used in the food products. So, there is an urgent need to educate ourselves about health risks associated with food products. Finally, we must grapple with the most difficult and pressing problem of our times—ensuring food for all. For a majority of our population, food is not a matter of choice. Those who live below the poverty line and subsist on less than US $1 a day, eat what they get. Of course, India has come a long way since the pre-Green Revolution era that was marked by chronic food shortage, food rationing and famines. But droughts continue to plague us and crop failures have made farmers’ suicide endemic to the country. India may claim to be a major producer of fruits, vegetables and dairy but we have failed to ensure an equitable distribution of this bounty. Welfare schemes crafted by the Central and state governments over the years have, to put it bluntly, failed to deliver. Will this change in the coming decades? 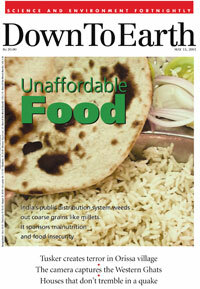 Will the poor and the underprivileged eat better and have a choice in the matter of food? There is a very real threat that many from this segment of population may get seduced by predatory advertising, fall prey to campaigns that popularise processed foods or waste their scarce resources on fun /fast/junk foods considered “aspirational”. Food taboos enforced by religious zealots are making a mockery of our democracy. It’s becoming impossible to discuss and debate questions of nutrition and taste dispassionately. How then does one speculate sensibly about what the Indians will eat after 25 years? Food, more than anything else, defines our identity. This is the reason it is so closely related to religious beliefs and cultural affinities. One only hopes that the youngsters will make intelligent, compassionate and resp onsible choices; choices that do not pollute or degrade the environment or put lives at risk. There is enough in our common plura listic heritage to celebrate and share. 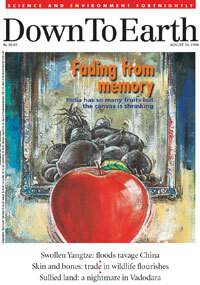 The answer is no different for other lesser-known fruits...where all the fruits you grew up with have gone. India has much to offer in terms of fruit diversity. The country can boast of as many as 50 indigenous fruits. By promoting rice over coarse grains, the government is promoting food scarcity and deficiency of micronutrients among India’s most malnourished sections. I have also noticed in the last 10 odd years, how people's behavior towards wheat has changed. Earlier everyone used to buy, wash, dry and get it grinded. But it is work. Isn't it far simpler to buy a 10kg or or 5 kg or 1kg wheat flour in a packet. Gradually the kids wouldn't know how a grain of wheat looks. Like our generation doesn't know anything about millets.